I heard a conversation on the radio this week about a young quarterback. The commentators explained how football players drafted in the first round will be given every opportunity to fail. They are seldom (never) cut from the team at the end of the preseason competition. 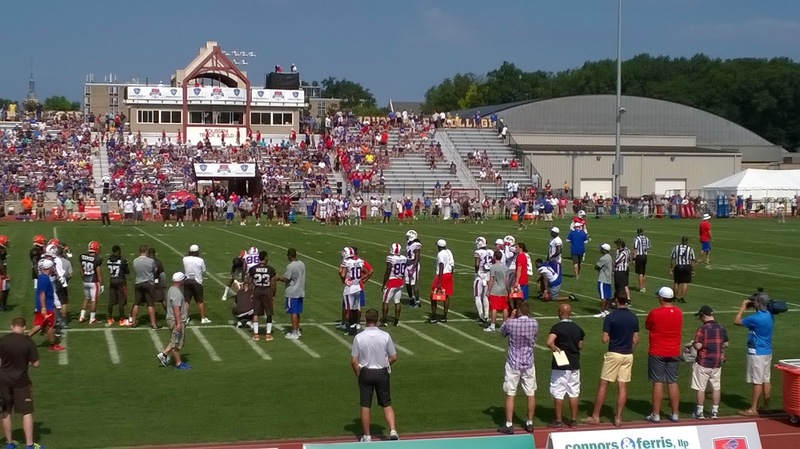 In contrast, NFL clubs will sign young, undrafted, players to temporary contracts to get them through training camp. Throughout the preseason NFL teams must gradually cut their squad from 90 players to 75, and then finally to 53 players on the teams roster at the start of the regular season. If you're doing the math, that means that 40% of the players present on the opening day of training camp won't play in the NFL that year. No other Bills wide receiver in 2014 even had 10 receptions for the year. This means that the seven other receivers in training camp are probably competing to maybe be the fourth WR on the team More likely, they're hoping to be the fifth or sixth WR on the team knowing that the sixth WR usually doesn't even dress for games. The sixth guy is just there in case of an injury to someone. Seven players. Two roster spots. Every play they make at training camp will be scrutinised. Every time a defender stops them. Every time they drop a ball. Every time they run to the wrong place on the field. That might be the time that the coaches decide this rookie's professional football career will never get started. Every play is vital. 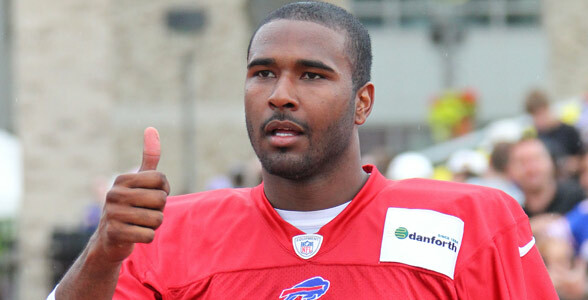 At the other extreme the Bills have EJ Manuel on their team. Manuel was the team's #1 draft pick in 2013 and the sixteenth pick overall. Through his first 15 games Manuel has a passer rating of 78.5. That's not very good. What did Manuel do to get himself benched in favor of Kyle Orton last year? If we had to pick one factor, it would be deep-ball accuracy. He completed only 28 percent of his throws that traveled 20 air yards or more (35th out of 42 QBs with at least 15 attempts). Manuel has a tendency to duck his head when a pass rush gets in his face, and his throwing mechanics suffer. Despite these shortcomings EJ is now entering his third year and the team is hoping that he will improve and this will be the year that he lives up to the potential they saw in him on that draft day in 2013. The team has shown him patience. They've invested the time and energy of numerous coaches into his development. They've used early picks in the draft to gain wide receivers who they hope will help Manuel out. And this year they'll pay him like a starting quarterback to be the third string quarterback, hoping against hope that he'll suddenly get it all together and become a superstar. Grace. Patience. Forgiveness. Time to Grow. Manuel gets plenty of these. Wide receivers 3 through 7? They'd better hope they graduated college or they'll be flipping burgers when the NFL season kicks off. The good news for you is that when God looks at you, he sees a first round draft pick. It doesn't matter how you see yourself. It doesn't matter how others view you. God sees someone precious. Because you're his first round draft pick, God gives you grace, patience, forgiveness, and time to grow. In Luke 15 Jesus tells the story of a shepherd who leaves his flock of 99 sheep to go back and find one that wandered away. He describes God's love for each person. The team bus won't wait for the #7 WR, but the QB drafted in the first round? The coach would probably drive to his house personally to make sure he was okay. So God views us as his first round draft pick, and treats us accordingly. As God's children, He gives us every opportunity to fail.